Immunoprecipitation of HeLa cell lysates using EGF Receptor (D38B1) XP® Rabbit mAb (Magnetic Bead Conjugate) (lane 1) and Rabbit (DA1E) mAb IgG XP® Isotype Control (Magnetic Bead Conjugate) #8726 (lane 2). The western blot was probed using EGF Receptor (D38B1) XP® Rabbit mAb #4267. 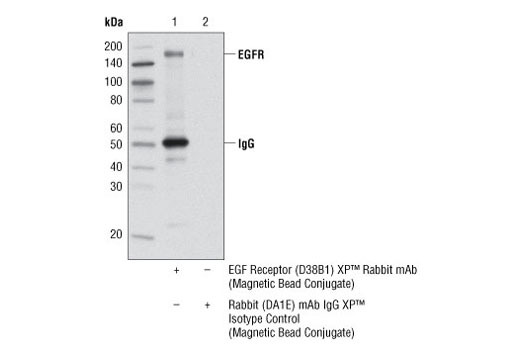 EGF Receptor (D38B1) XP® Rabbit mAb (Magnetic Bead Conjugate) detects endogenous levels of total EGF receptor protein. The antibody does not cross-react with other proteins of the ErbB family. This Cell Signaling Technology antibody is immobilized by the covalent reaction of hydrazinonicotinamide-modifed antibody with formylbenzamide-modified magnetic bead. EGF Receptor (D38B1) XP® Rabbit mAb (Magnetic Bead Conjugate) is useful for immunoprecipitation assays of EGF receptor protein. The unconjugated EGF Receptor (D38B1) XP® Rabbit mAb #4267 reacts with human, mouse, and monkey EGF Receptor protein. CST expects that EGF Receptor (D38B1) XP® Rabbit mAb (Magnetic Bead Conjugate) will also recognize EGF Receptor in these species.